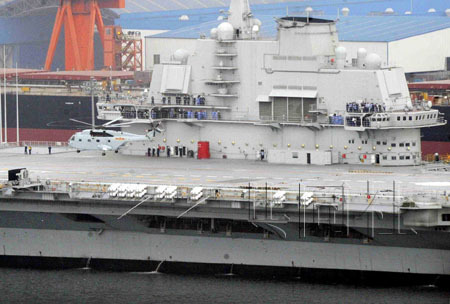 The writing has been on the wall the past few weeks, but signs are pointing to the former Soviet/Russian aircraft carrier Varyag, now owned by China's People's Liberation Army Navy (PLAN), making it's maiden voyage for sea trials from Dalian, China before the next week is out. From the Chinese government officially acknowledging that the ship exists and will be used as a training carrier with a view to building more such ships, to daily eyewitness reports online of activity on board, things are definitely moving along. 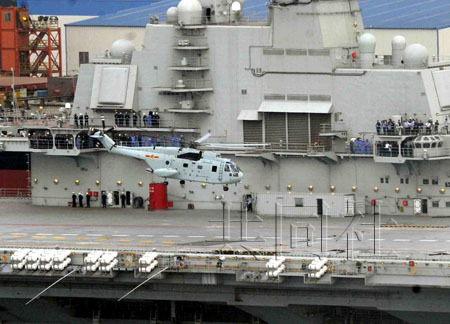 Meanwhile, Kyodo's Chinese website has released photos, dated August 5 2011, showing a Changhe Z-8 helicopter (licence-built Aerospatiale SA 321 Super Frelon) operating from the Varyag/Shi Lang. It has been reported that the ship will be renamed, after a Qing Dynasty admiral who conquered Taiwan in 1681, but that has not been officially confirmed.